Nothing else matters - This beautiful band is unisex and makes a wonderful wedding band. 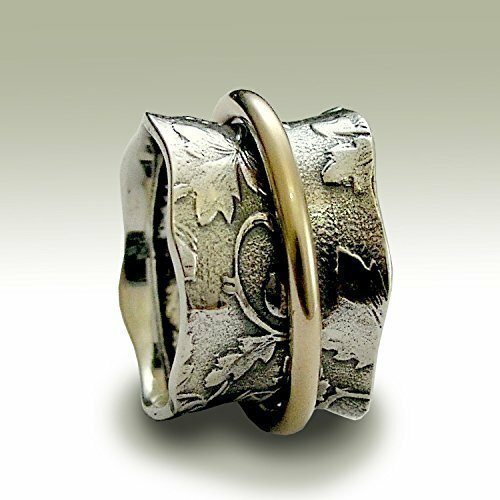 The main band is made of oxidized sterling silver with filigree, leaf design. Surrounding the band, a beautiful gold filled spinner. (R1736A). © 2011 Artisanimpact Inc. All rights reserved. Construction & Dimensions: Sterling silver, gold filled. Approximate width: 11mm -13mm (wavy) We can make any size, including quarter sizes. For this wider band, we suggest adding .5 to your current thin ring size. Please choose your size in the drop down menu, when you check out. If you have any questions about this product by ArtisanLook, contact us by completing and submitting the form below. If you are looking for a specif part number, please include it with your message.